Summary: The description, specs, pricing, photo and user ratings for the Glock 21 Gen4 pistol. The Glock 21 Gen4 is, like its close relative the Glock 21 Gen3, a semiauto built on a full-size polymer frame and chambered in .45 ACP. Standard features include three-dot fixed sights and a trigger safety. In addition, the Gen4 offers several new features, including a multiple backstrap frame with a reduced short-frame trigger mechanism housing. The multiple backstrap system allows the user to change the circumference of the grip to fit their individual hand size. The grip has three options: a short frame, a medium frame or a large frame. The backstraps are easily changed and secured with a single pin. Note: The Gen4’s grip angle is not changed by backstrap modifications to ensure a shooter doesn’t shoot high or low when modifying the backstrap or when shooting a different Glock pistol. The 21 Gen4 also sports a Rough Textured Frame (RTF) surface designed to enhance grip traction, and its magazine release catch is now reversible and enlarged. This allows users to switch the catch to the left or right side of the pistol with no additional parts. Finally, the original recoil spring has been replaced with a dual recoil spring assembly designed to reduce recoil while simultaneously increasing the assembly’s life cycle. Reviews: Here are links to in-depth reviews of the Glock 17 Gen4, the Glock 22 Gen4 and the Glock 37/38/39 Gen3s. 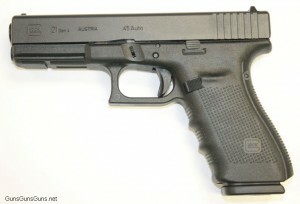 This entry was posted in .45 ACP, $501-$750, Full size, Glock, Semiauto on October 14, 2011 by Staff. I use the Glock 20/21 as my backup piece to my Sig 220 combat. It has never let me down when I needed her. She is a good reliable gun you can trust to go bang each squeeze of the trigger. I primarily carry it as a 21 but I have the magazines and slide to convert it back to 10mm if need be. But for ease of ammo availability, I tend to stick with the 21 configuration. I also went ahead and stippled the frame in order to assure myself of a solid grip. A single drawback to this pistol is the girth of the grip. It is made for guys…or gals with some BIG hands. It is a good, reliable backup weapon. I would not hesitate to use it if necessary.